Our poor side dishes. Always getting buried at the bottom of a post that stars some showstopping piece of meat. But as anyone who is putting together her holiday party outfit knows, it’s all in the accessories, and so herewith, a round-up of some of our favorite unsung sidedish heroes. 1. Gingered Green Beans Add a couple handfuls of green beans (about 2 cups or what’s shown above) to boiling water that has been salted. Cook 2 minutes then immediately plunge into a bowl of ice water to stop the cooking and preserve the beans’ bright green color. After a minute, drain and pat dry with a paper towel. In a medium skillet set over medium heat, add a tablespoon of vegetable oil with a drop or two of sesame oil. Add 1 tablespoon minced, peeled, fresh ginger, 1 large garlic clove (minced), and cook 1 minute. Add beans, a little kosher salt, and toss everything until beans are coated. 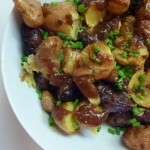 Raise heat a bit and stir in a teaspoon of rice wine vinegar and a teaspoon and a half soy sauce. Cook another minute then serve. 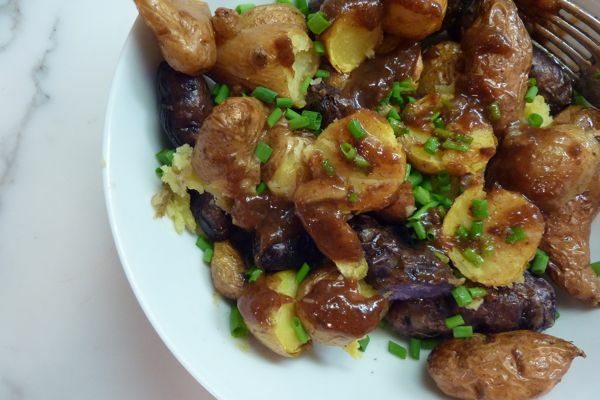 Roast Potatoes with Chutney and Yogurt Chop 6 to 8 red or Yukon gold potatoes a few handfuls of fingerlings and toss with olive oil, salt, and pepper. Roast for 30-35 minutes until potatoes are golden and crispy. Toss in a dollop of fruity chutney (increasingly the only ones I ever use are Pomegranate or Plum from Bombay Emerald) a few chopped chives, and serve topped with another dollop of plain yogurt. 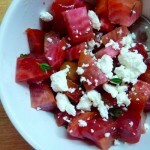 Roasted Beets with Honey, Feta, and Thyme Wrap 4 to 5 beets in foil and Roast at 425°F for 40 minutes. Remove and cool. Peel and chop them into a fine dice then toss with a squeeze of honey, a drizzle of olive oil, salt and freshly ground pepper. 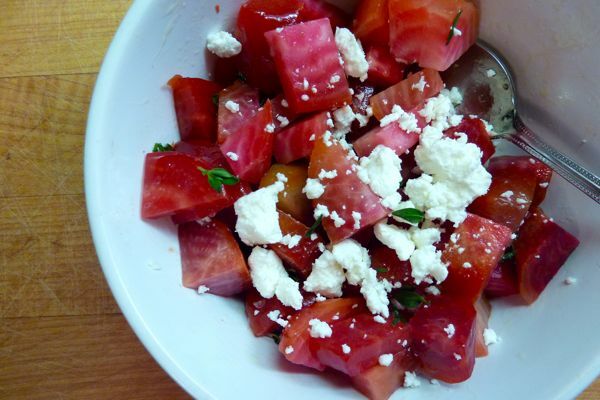 Sprinkle with crumbled feta and some fresh thyme. Roast Cauliflower with Shallot Breadcrumbs Toss 1 head cauliflower (broken into florets) with olive oil, a squeeze of fresh lemon, salt, and pepper, and a pinch of sugar. Roast in a 400°F degree oven until golden, approximately 30 minutes. Meanwhile, prepare breadcrumbs. Heat about 3 tablespoons olive oil in a saute pan set over medium heat. Add a clove of garlic (minced), 1 small shallot (diced) and 1/2 cup breadcrumbs. Cook for approximately 5 to 7 minutes until golden. 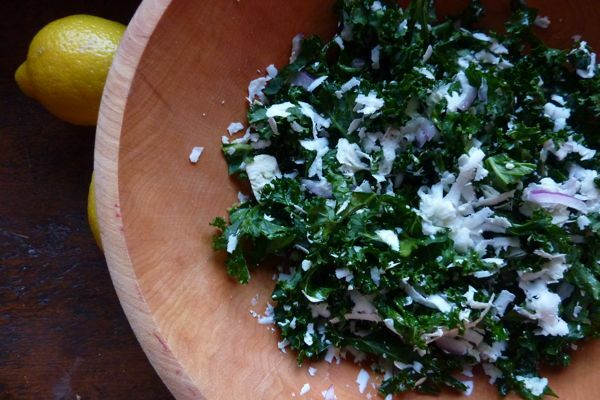 Toss cauliflower with breadcrumbs and sprinkle with chopped fresh herbs, such as parsley, sage, or thyme. 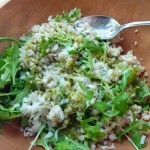 Barley & Arugula Salad Cook barley according to package directions. 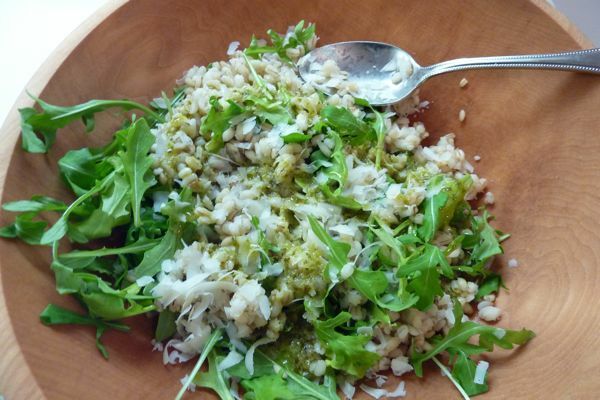 Toss with baby arugula and your favorite red- or white-wine based vinaigrette. (I added a little storebought pesto to mine, but you could also just add whatever fresh herb is lying around.) Add shreddedParmesan and toss. 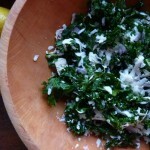 Kale Salad with Ricotta Salata Wash and trim the stems off two large handfuls of kale. Chop into confetti-like strands as shown. Shred a boatload of ricotta salata on top, add about 1 tablespoon of red onion that has been sliced to the point of transparency. Add a few glugs of olive oil, a squeeze of lemon, and freshly ground pepper. 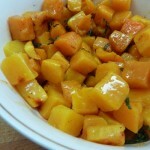 Roast Butternut Squash with Smoked Paprika, Butter and Sage Peel and chop one butternut squash into small cubes. (Or better yet, buy the package of pre-cut squash at Trader Joes.) Toss with olive oil, salt, and pepper. Roast on a foil-lined cookie sheet at 425°F until the squash is tender, about 35-40 minutes. 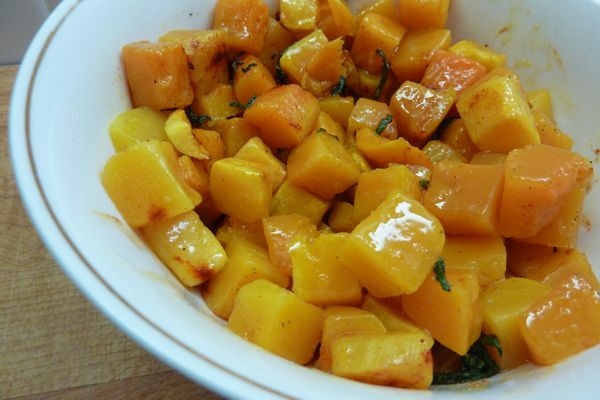 Place squash in a bowl and toss with a teaspoon of smoked paprika, a pat of unsalted butter, and 3-4 fresh sage leaves (chopped). 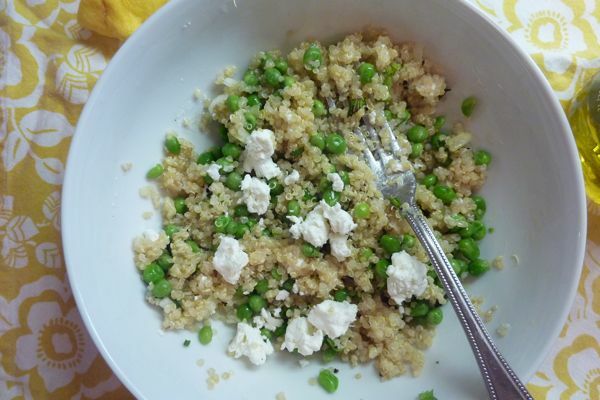 Quinoa with Feta and Mint Bring 2 cups water to a boil in a medium saucepan. Add 1 cup of quinoa and simmer, covered, until tender, fluffy, and water is absorbed — about 15 minutes. Let stand, covered, off the heat for 5 minutes, then fluff with a fork. (This yields about 4 cups cooked quinoa.) Toss with 1 tablespoon chopped fresh mint, a handful of crumbled feta, a handful of thawed frozen peas, squeeze of lemon, and a drizzle of olive oil, and salt and pepper. If you are so inclined, add a dollop of plain yogurt. 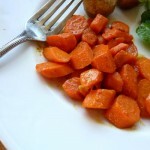 Curried Buttered Carrots, the Girls Favorite. Peel four medium-large carrots and cut them into quarter-inch rounds. Tossed them in a pot with 1/2 cup of water, 2 tsp of curry powder, a small pat of butter, some kosher salt, and a squeeze of honey. Simmered, covered, for 15 minutes. Orange Sweet Potato (Not Pictured) Mash Bake 2 medium sweet potatoes at 425°F for 40-45 minutes. Slice and scoop out flesh into a bowl, add 2 tablespoons butter, about 1 tablespoon orange juice, salt and pepper, and mash with a fork (I use a beater attachment from a handheld mixer) until smooth. Oh Jenny! Love this! I could just eat plates of sides every meal, all day long. 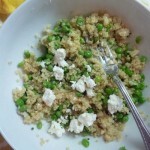 Love that minty feta quinoa with yogurt–mmmmm! Great post! I’ve been trying to think of some sides for Christmas Eve dinner….I feel like I make the same things all the time, so happy for some new ideas! all of these look so great. I will try them during the holidays. What’s a side dish to one person is a main course to another. Thanks from this vegetarian household! 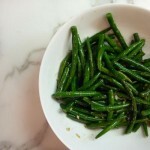 I think I’ll be putting those gingered green beans on our Christmas Eve menu! I will say that the butternut squash w/ smoked paprika and sage is my current obsession. I need to be careful or it will join that corn-sausage stew w/ status as flame-out love affair. Yay for Jenny! I just logged on to see if I could find some good sides for next week, et Voila! Well done! 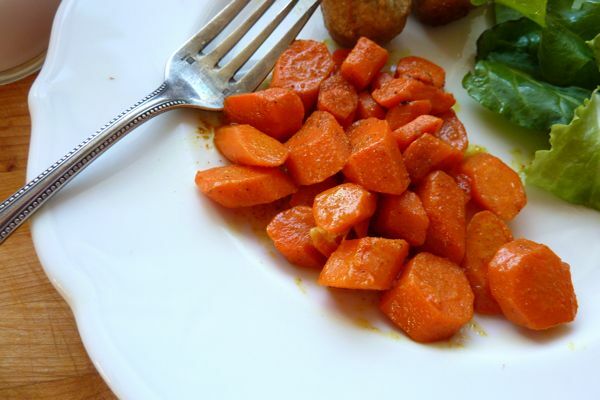 I made the curried butter carrots Friday night for dinner guests and they came out amazing! Will definitely be making those again. Thanks. Just thinking of what side dishes to make for christmas. These look great! I’ve got a question : do you really dunk your beans in icewater ? 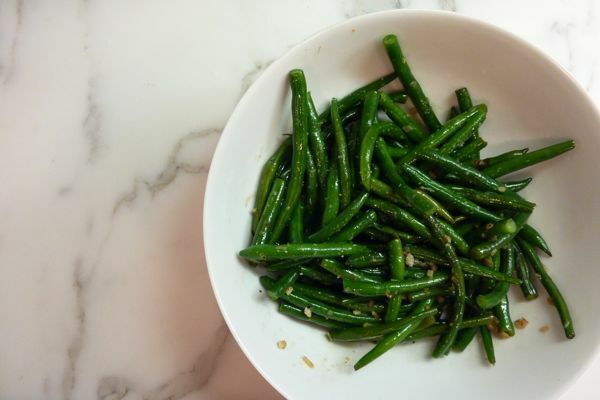 Meinhart – It’s not just to make the beans green — it’s also to stop the cooking so they don’t end up overcooked. Nothing worse than a mushy green bean. with a bona fide experiment : half in ice water and half the way I usually do it. 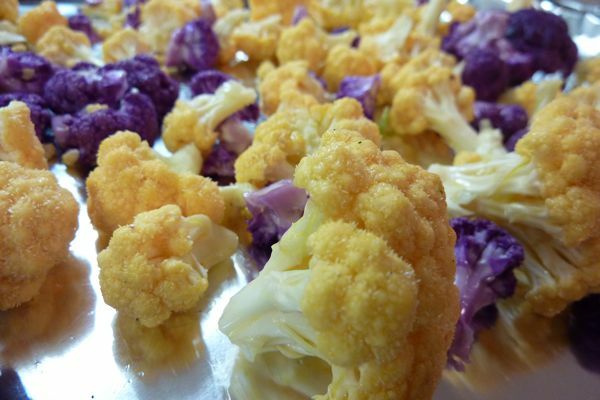 The roasted cauliflower sounds pretty good, even to a cauliflower-hater as myself. 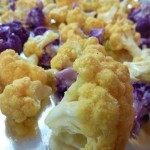 Great ideas for more veggies at mealtime!! Love your blog. I am a newsletter subscriber. Do I win the Baked Better Bread Prize?